In his Apostolic Exhortation, Evangelii Gaudium (The Joy of the Gospel), Pope Francis put his finger on one of the principal obstacles to spreading the Good News of the Gospel. "Pastoral ministry in a missionary key seeks to abandon the complacent attitude that says: We have always done it this way." 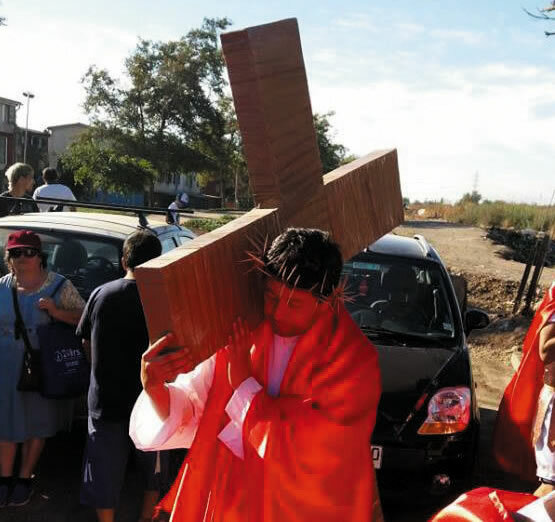 The youth of the Columban parish of San Matías decided to take seriously the warning of the Holy Father this past Holy Week. San Matías is located on the southern boundary of the sprawling city of Santiago. The area where the parish is located is called Bajos de Mena, the name which was used to designate the area when it was farming land. Today, it is a densely populated sector of the municipality of Puente Alto, the most populated municipality in Chile. The people who live in the territory of San Matías parish are working class men and women who struggle against the odds to make a living and raise their families. There are many social problems in the area: overcrowding, high youth unemployment, lack of infrastructure, crime, violence and drug trafficking. The parish has nine chapels which attend to the religious and social needs of the people in their poblaciones (housing estates). Since I arrived to live and work in Puente Alto and in the parish of San Matías, every Holy Week each chapel has organized the Holy Week liturgies and zealously maintained the privilege of having all the ceremonies in their own chapel. It is always a difficult balancing act for the priests and deacons of the parish to satisfy the demands of each chapel. But this year, the youth of the parish approached the pastor, Fr. John Greene, a priest of the Archdiocese of Dublin and a Columban associate priest, and asked to be allowed to organize the Via Crucis (Stations of the Cross) for the whole parish. They wanted to enact the Passion and Crucifixion of Jesus and produce a live Via Crucis which would process through the housing estates and visit all the chapels. Fr. John liked the idea but feared that the adults of the chapels would oppose the idea. The youth of the parish asked permission to make their proposal to the parish council. Instead of opposition, they received an enthusiastic approval of the council members. Right from the start, the young people asked for the collaboration of the adults. The different roles of the men and women of the Passion narratives were to be performed by the youth and the adults. Mothers were asked to make the costumes. Deacon Sergio Alvarez was chosen to play the part of Jesus. Each chapel was responsible for at least one station. Each station of the cross would include a dramatization, a reading from the Gospel narrative of the Passion, a short reflection and prayer. Hymns were chosen to accompany the pilgrims as they walked. Fr. John and members of the parish council met with the youthful organizers to plan carefully the various stations of the Cross. As Episcopal Vicar for the Maipo Vicariate of the Archdiocese of Santiago, my responsibilities were to negotiate with the municipality three things: the use of the municipal park named after Pope St. John Paul II as the scene of the final three stations, the building of a stage for the Crucifixion and an amplifying system. Our mayor, German Codina, generously provided all three! Personally, I was very pleased with the initiative, but I had my doubts that the adults of the parish would respond. I was wrong! On Good Friday at 4:00 p.m., we all assembled in front of the chapel of the Sagrado Corazón (Sacred Heart) to begin the Via Crucis. I was surprised by the number of adults who showed up. There were a number of senior citizens among them. When I saw Sister Margarita Rivera — who is 85 years old — with her walking stick, I invited her to travel in one of the vehicles being used to transport the amplification system. She reminded me that the Via Crucis is about walking with the Lord as He carries the Cross and that she would walk as far as she could! For the next four hours, we walked through the streets of the parish. Many people stopped to watch the procession and blessed themselves. It was a way of reminding them of the importance of Good Friday for all Christians. After a few stations, some people dropped out, but they were soon replaced by others. Sr. Margarita left us and was taken home, but she had fulfilled her desire to walk with the Lord. At the sixth and ninth stations, we took a short break before continuing on. At each chapel, there was water for us to drink if we needed it. At 8:00 p.m., we arrived at the park of St. John Paul II. 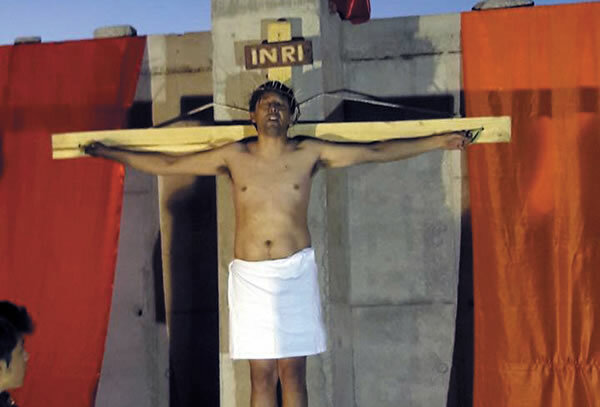 Two young men who represented the thieves were already on their crosses. Now, Jesus was nailed to the Cross which was then elevated on the stage. The crowd became silent, as we heard the words: "Jesus, knowing that his hour had come to pass from this world, having loved those who were his in the world, loved them to the end." (John 13, 1) When Jesus died on the Cross, many people knelt. The young people then took Him down from the cross and gave Him to His Mother, Mary. I was impressed by the reverence and the silence of all the pilgrims at that particular moment. Quietly, we walked in silence to the outdoor altar of the park. There we celebrated the Good Friday liturgy. At 9:30 p.m., our Via Crucis and Good Friday liturgy ended, and we walked quietly to our homes awaiting the Good News of the Resurrection. Columban Fr. Michael Hoban lives and works in Chile.